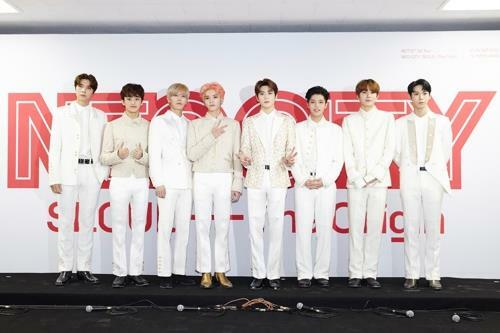 “If you look at each of our songs carefully, there are no overlapping genres I think,” NCT 127 member Doyoung said in a press conference ahead of a concert in Olympic Park in eastern Seoul on Sunday. “I would say our genre is a challenge. Without having a fixed concept, we want to show new things every time we return and pursue the concept of attempting fresh things,” he said. On Sunday, NCT 127 held the last part of its two-day concert “NEO CITY: SEOUL – The Origin,” the boy group’s first solo concert since its debut in 2016. “We are proud of holding our first solo concert … it is the realization of our dream that we have had since we were trainees,” member Taeyong said. “We are grateful that we are giving (our first concert) at Olympic Gymnastics Arena, but we still have a dream of meeting our fans on a bigger stage since we aim high,” member Jaehyun said. “I was very thrilled to see a sea of yellow-green (lights). I want to give thanks to our fans,” member Johnny said, recalling the first leg of the Seoul concert a day earlier. Yellow-green is the signature color of the light sticks for NCT 127 fans. In late October, NCT 127 debuted their first studio album, “Regular-Irregular,” on the Billboard 200 chart, becoming the second K-pop boy band to appear on the competitive album chart following BTS. “To be honest, I am very nervous about going on a big stage right after joining the band. I am putting in a lot of effort not to lag behind,” Jungwoo said. Member Haechan, however, was absent from the Sunday press conference due to an ankle injury. This injury also exempted him from the two-day concert’s wild performance parts. “Haechan must be very sorry about his absence, but he will join the vocal parts of the concert with his honey-sweet voice,” member Taeyong noted. “Like last year, we told our fans that we will have a ton of opportunities to see us (on television and other public programs). We will continue to work hard this year so we can frequently reach out to fans,” Doyoung said.